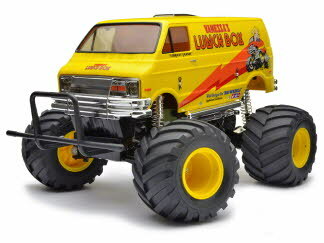 Another one of Tamiya's classic creations, the R/C Lunch Box (1st released, 1987) was loved for its camp appearance as much as for its R/C performance. The boxy minivan body raised up over monster truck wheels ensure that this R/C van will get attention anywhere you choose to drive it. Use the sides of the van as a canvas to paint your own original designs for the ultimate conversation piece!